Amoeba (also spelled ameba) is a genus of protozoa that moves by means of temporary projections called pseudopods (false feet), and is well-known as a representative unicellular organism. Protozoa are single-celled eukaryotes, which demonstrate mobility and heterotrophy like animals, but are grouped in the kingdom Protista. The plural of amoeba is spelled either amoebas or amoebae. The word amoeba is also used to refer to both this genus and its close relatives, now grouped as the "Amoebozoa," as well as to refer to all unicellular organisms that move by pseudopods. The pseudopods, or "false feet," result from the extension of cytoplasm outward. Any cells that move or feed by such temporary projections are referred to as amoeboid, and even some cells in multicellular organisms are called amoeboid, such as human white blood cells. The amoeba is one of nature's simplest organisms; yet, it shares many common features with nature's most advanced being, Homo sapiens, such as DNA, cellular structure, and the phagocytosis activity of the white blood cells, whereby they engulf and destroy pathogens. Because of their simplistic nature, amoebas are often referenced in discussions of evolution, as those advocating design question how organisms as simple as amoebas can evolve by accident or chance to yield the great complexity seen in life today. While amoebas commonly are presented as reproducing asexually, some researchers have argued that analysis of the evidence of sexual reproduction in several amoeboid lineages leads to the conclusion that amoeboid lineages are anciently sexual and asexual groups are a more recent development. Early naturalists referred to amoeba as the Proteus animalcule, after a Greek god who could change his shape. The name amibe was given to it by Bery St. Vincent, from the Greek amoibe, meaning change. Amoebas, in the narrowest sense of the word (the genus), are found in freshwater, typically on decaying vegetation from streams, but are not especially common in nature. However, because of the ease with which they may be obtained and kept in the lab, they are common objects of study, both as representative protozoa and to demonstrate cell structure and function. The cells have several lobose pseudopods, with one large tubular pseudopod at the anterior and several secondary ones branching to the sides. The most famous amoeba species, A. proteus, is 700–800 μm in length, but many others are much smaller. Each has a single nucleus, and a simple contractile vacuole that maintains its osmotic pressure, as its most recognizable features. Amoebas are characterized by the pseudopodia, which are used in both transportation and digestion. They can encircle smaller protists and bacteria, close around them, and secrete digestive enzymes into this vacuole. The jellylike cytoplasm is differentiated into three parts, the thin, outer plasma membrane, a stiffer ectoplasmic layer within the outer plasma membrane, and the granular endoplasm in the center, which contains the nucleus and vacuoles. Amoebas absorb oxygen and water across the entire plasma membrane. Amoebas are popularly considered to reproduce asexually by splitting into two parts, similar to the cell division (mitosis followed by cytokinesis) in multicellular eukaryotes. That is, the original amoeba divides into two cells. For this reason, writer Tom Robbins states, in the preface to his book Even Cowgirls Get the Blues, that amoebas are interesting because their reproduction method means that the first amoeba is still alive to this day. However, the actual life cycle of an amoeba is on the order of a few days to a few months to perhaps a year or more. For example, Taylor (1952) reports that the life cycle of Amoeba hugonis is two months and that A. villosa reach adulthood in two or three months. On the other hand, M. Metcalf (1910) references that the well-known A. proteus can have a life cycle of a year or more. Some researches, however, content that sexual reproduction was the predominant form of reproduction of ancient amoeboid lineages and that the extent of asexuality in many lineages is overestimated. Lahr et al. (2011) contend that the evidence of sexual reproduction in several amoeboid lineages, when mapped onto the eukaryote tree of life, "demonstrates that the majority of amoeboid lineages are, contrary to popular belief, anciently sexual, and that most asexual groups have probably arisen recently and independently." During adverse conditions, amoebas can enter a temporary encysted stage, as a result of eliminating water and adding a protective coat. There have been some reports of sexual reproduction; however, such accounts are unconfirmed. 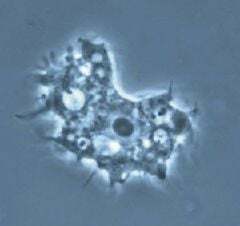 There are at least six species of amoeba, in the broader sense of amoebozoa, that are parasitic in humans. However, most of them have an impact on the body characterized as "nonpathogenic intestinal amoeba infection." That means that these parasites are classified as ones that never make people sick or harm the body, even in people with weak immune systems. For example, Entamoeba coli, Entamoeba dispar, and Entamoeba hartmanni are considered harmless parasites. Entamoeba histolytica, however, is a parasitic amoebozoa that negatively impacts the human body, resulting in the infectious disease known as amebiasis. It is most common in developing countries that have poor sanitary conditions. Mild amebiasis is associated with stomach pain and stomach cramping, but a severe form is amebic dysentery, which can cause stomach pain, fever, and bloody stools. In the worse (but rare) cases, it can spread to other parts of the body, including the brain and lungs. As a protection, one is advised to drink only bottled or boiled water, versus drinking from fountain drinks, or taking any drinks with ice cubes. (Thus, the line in Sammy Hager's song "Más Tequila," set in Mexico: "You can drink the water, but don't eat the ice.") One is also advised not to eat fresh fruit or vegetables that you did not personally peel, or non-pasteurized dairy products. A good method of collecting amoeba is to lower a jar upside down until it is just above the sediment surface. Then, slowly let air escape so the top layer will be sucked into the jar. Effort should be made to not allow deeper sediment to get sucked in. The jar can be slowly moved when tilting it so the collection can be from a larger area. If no amoebas are found, one can try introducing some rice grains into the jar and waiting for them to start to rot. The bacteria eating the rice will be eaten by the amoeba, thus increasing the population and making them easier to find. Metcalf, M. 1910. Studies upon amoeba. Journal of Experimental Zoology 9:301-332. Taylor, M. 1952. Amoeba hugonis n.sp. : Life-history. Quarterly Journal of Microscopical Science 93: 427-433. This page was last modified on 3 July 2015, at 22:01.